Nihang bodies today celebrated Hola Mohalla together for the first time. Celebrations started from Kesgarh Sahib today. Participating nihang organisations included Tarna Dal, Marhiyan Wale, Baba Bakale Wala, Bidhichandiye and Hariyan Bela wale. 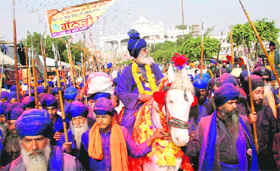 All the organisations observed Hola Mohalla celebrations under Baba Balbir Singh from Budha Dal. Jathedar Takht Sri Kesgarh Sahib Giani Tarlochan Singh and Jathedar Akal Takht Giani Gurbachan Singh honoured leaders of Sikh organisations. Meanwhile, week-long celebrations, too, came to an end today. Editors Note: On Feb 26th the two factions of the Buddha Dal met to reconcile their differences. 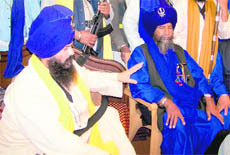 Baba Joginder Singh met with the SGPC installed Baba Balbir Singh to ensure that the hostilities between both groups would cease and they would work jointly in the future. 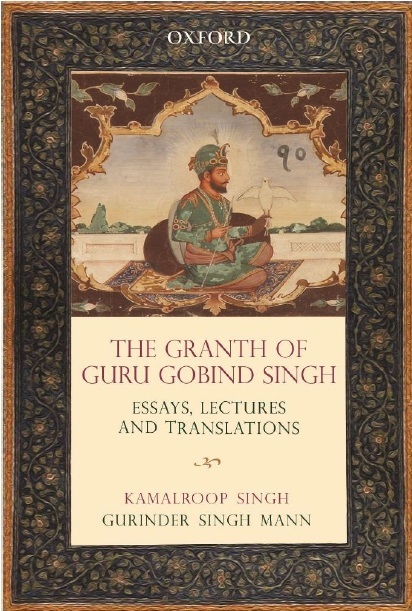 On 12th December 2009 a book on Shri Dasam Granth Sahib Ji is released, Baba Joginder Singh Ji participate, book has forwarding by him. Again on 5th January Sach Di Vela(News paper) is released at Raqba. In both book and newspaper Baba Ji of Raqba carry out only positive prapoganda, When this reported to Baba Balbeer Singh via Mahant Lakhbir Singh of Delhi, questions are asked weather ever Baba Joginder Singh Ji ever use media against Baba Balbeer Singh Ji. Asnswer comes via Anbhol Singh Diwana, the editor that there is a strict instruction that critisim what so ever be of fellow Nihung will be done. This gives a good signal to Baba Balbeer Singh Side. Help is asked for the newspaper from him by vijaydeep Singh. Baba Lakhbir Singh plays an important role in all this affair. On 29th January Baba Dyal Singh Visits Delhi. On 3rd Februray on ward Baba Lakhbir Singh goes missing. This is discovered by his son on 5th Feburary. Police is on look out. Nihung Singhs themselves launch a look out. They are able to make some pseudo Nihungs confess that crime, that they have murdered Baba Lakhbir Singh Ji and dumped his body on banks of Yamuna, could not throw it in river as police van just came near. They burnt his hairs and beard to hide his identity. Accused lady names good lot of Nihungs herself. Some phone calls are recived by vijaydeep from politicians about who is framming the charges ? On confirmation it is found out that these are prart of confessions of the accused and not the victem's complaint. Politician is forwarded the Number of Baba Piara Singh Ji, In charge of security of Baba Balbir Singh Ji. Proper arrangements are made that Baba Joginder Singh Ji's name does not figure in any case. All steps are taken for that. Baba Ji of Raqba meet Baba Balbir Singh Ji as told to by Anbhol singh Ji. First praise for Baba Joginder Singh Ji Raqba by Baba Balbir Singh Ji is that He(Raqba Wale Baba Ji) are doing great service of preaching Panth via news paper and inspite of having good chance tendeny for not personal rivalry comes in between Dharam Prachar(preaching of faith) and not misusing the media against brthren Nihungs have won the heart of rivals of Baba Joginder Singh Ji. He was during the time of conflict also addressed as Sadh Purush(Godly Man). Salute to Baba Joginder Singh Ji. Sache Marag Chaldeyan Ustat Kare Jahan.World do praise for one who treads the path of truth. It is hoped that Both Jathedars, who are pro Dalits(Deprived tribes) will work togather to uplift the deprived and restore equality to them in Punjab and India.